If you exit I-65 at Valleydale Road and turn right, you can’t help but notice civilization start to shrink back. Smaller neighborhoods. Less hustle and bustle. Fewer worries and concerns. Eventually, the road loses its name and turns into HWY 261. Just before a lone redlight, you see the small, weathered sign that says “Pelham High School Next Left.” To your right is nothing but grass, brush, and some distant ranch style homes with a large farmhouse anchored amidst a vast farm. Further on, you weave through gaping quarries while the speed limit unnecessarily slows to 35mph. You hit a bridge that is up to Madison County, IA standards, and to your right are old buildings worthy of the wild west. Welcome to Helena, Alabama – home to a beloved young man who never played a down at Auburn, but left an indelible mark on the Tiger football team. Evan Thomason was just like any other ten-year old boy from your neighborhood. But unlike most, Thomason was diagnosed with and battled valiantly against a rare form of cancer known as neuroblastoma. 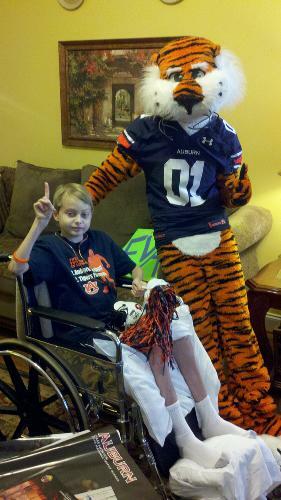 His prognosis was always bleak but Evan maintained a positive demeanor and found strength and joy in the Auburn Tigers. Sadly, Evan passed away on Thursday, September 22. While tragedy has struck this young man and his family, the amount of joy he has brought to his community is unmatched. And his community is much larger than the small, quaint town of Helena. To say that Evan Thomason was one of Auburn’s greatest fans would be an understatement. Evan was part of the Auburn family. Evan’s community stretched 150 miles west into the center of Lee County. Evan’s love for Auburn was by no means one sided. It was reciprocated by Auburn fans, players, coaches, and even mascots. Over the past few years, numerous players including Neil Caudle, Tommy Trott, Andrew McCain, Barrett Trotter, Michael Dyer and Phillip Lutzenkirchen shared time with Evan. Coaches such as Trooper Taylor and Gene Chizik embraced him as a member of their team. And even Aubie made a special visit to spend time with the ten-year old fan. While we may be discouraged by the recent loss to Clemson and while concerns over defensive woes are still on our minds, it’s important to remember that there are much greater battles being waged every day. In difficult times, families rely on each other. This Auburn team, this coaching staff and all of us as fans strive to be a family. Luckily for us and especially Evan and others like him, this team truly understands what family means. A football team is an entertainment product. A family is an inclusive, loving, nurturing, all-encompassing, unshakable bond. Auburn lost a family member Thursday morning. We lost a family member long before he could take his first steps as an Auburn student; a family member who resided in a small town that sits aside the Cahaba River. A family member who may be distant to many of us, but whose impact cannot be overstated. Please keep Evan Thomason and his family in your thoughts and prayers tonight and tomorrow. Quite a few young men will still be thinking of him when they take the field under the lights of Jordan-Hare on Saturday night. War Eagle, Evan and God Bless. For more information about Evan, visit his website at CaringBridge.org. As I read all these comments with tears in my eyes, I have never been prouder than I am right now to be a member of the Helena community, an Auburn fan and a resident of the great state of Alabama. Evan, besides touching so many during your short stay on this earth, you will continue to be an inspiration to many more in the months to come. War Eagle, Evan! As I read this article I am deeply touched by the bravery this young man had. His passion, love and the ability to make others happy is overwhelming. Congratulations to the Auburn Family for embracing this young man during a time where a little more encouragement and happiness was needed. God Bless his family and the Auburn Family as well. May he rest in peace. WAR EAGLE! Evan was a VERY, VERY smart child-man! Not only was he smart, he was very talented, a great Christian, and a truly PASSIONATE Auburn fan! He understood the game as well as any adult, and could talk theology with any theologian. He faced and understood death better than any adult I have ever worked with or met. He could play with children, pray as well as a bishop, and explain the Auburn offence to any life-long coach. It was a great honor to know him, although I admit I wish I had known him better. I’ve just finished watching Evan’s YouTube video, Listening to his mothers voice give her son’s eulogy while pictures of a life well lived cascaded in front of my eyes. You see I’ve never had the honor of meeting this giant, Evan, but our Sunday School class has prayed for him, celebrated his milestones and cried with his setbacks, for years now. So Evan’s legacy has touched Fayetteville GA too, and the near 40 members of our Sunday School class, all of whom look forward to meeting this brave warrior in Heaven some day. To Evan’s immediate and extended family, friends & fans, my heart goes out to you as well as my prayers. I’m very saddened to heaf of Evan’s passing. My sympathies and prayers go out to his family. Evan made the world a better place in his short time here. His influence will be felt for years to come. He did Auburn proud. And I hope we all feel honored that he chose to be one of us. I certainly do.